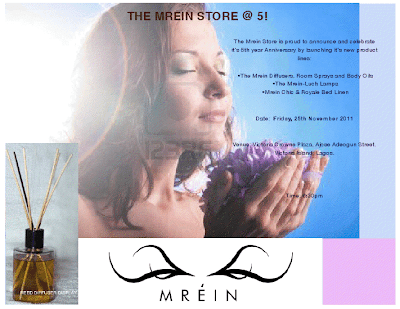 Mrein Lifestyle Store was founded in 2006, a vision that originated from the passion of it's visionary, Mercedes Richards and her love for fragrances. It started out as a store carrying home and lifestyle products like reed diffusers, body sprays, furniture and all it takes to make one's living quarters a Haven! Five years on and they're set to launch their own product line: reed diffusers, room sprays and bodyoils, the Mrein-Luch lamps are beautifully crafted lamps made from original African fabric and the Mrein-Chic & Royal Bed Linen which are bed linen made from raw silk and African fabric. Mrein will mark it's 5th anniversary and launch these product lines on the 25th of November 2011 at Victoria Crown Plaza Hotel Victoria Island at 6:30pm. There will be a fashion show by reputable fashion designers and entertainment provided by some of Niferia's finest music acts. which kain names be dis? mrein? look for names that are easy to remember and pronounce biko! lolz. All the same, Kudos big and beautiful lady!